Found this on the Boston Craigslist. Excellent marketing ploy but a total rip off. 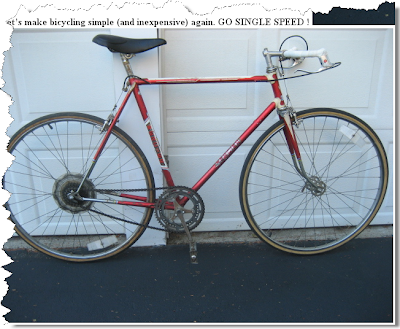 I wouldn't pay $250 for that pig, because it's simply your run of the mill 27" road bike converted to single speed with no love and all original parts. He must be betting on the PT Barnum Principle. Here are a few observations: The chop bars are really chopped down to resemble bull horn bars, so he's lying in the offer when he says they are bull horns. Original brakes (should have at least left a little curvature on the bars and mounted the brakes fang style). Looks like the original handlebar tape, too. Absolutely no attempt to take up the chain slack in making it a single speed by using the original cassett. In fact, he left so much slack in the chain that all you would have to do is sneeze and it would probably fall off. What is with the pie plate? That's so gauche! I do like the seller’s marketing campaign but if you put lipstick on a pig (and this guy didn’t even use any), it’s still a pig! I think the seller made a mistake and put an extra 0 in the price. $25 clams is reasonable. 1. Direct Chain Line - You have a more powerful and efficient pedal stroke with a straight, short chain line – rather than snaking the chain through derailleur pulleys. 2. Less Expensive Bicycle – Shifters and derailleurs comprise a large portion of the price of a new bike – often in the hundreds of dollars. 3. Easy cleaning of bike. – It is far easier to keep a bike clean and humming without gear clusters, derailleurs, extra cables, etc. 4. Less maintenance of bike – Shifting problems are a major source of malfunction on bicycles. Who needs the angst of shifting problems. 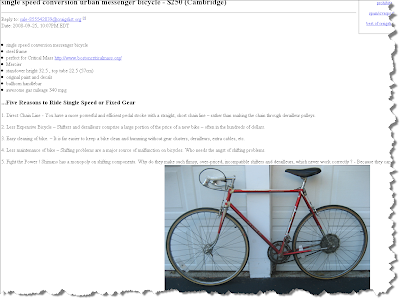 Boston Cyclists that use Craigslist are definitely unique. There's a fine line between revitalizing an old bicycle and wrecking a 27" road bike. You have found that line.